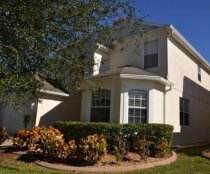 This beautiful executive style home has been professionally furnished to the highest possible standard. 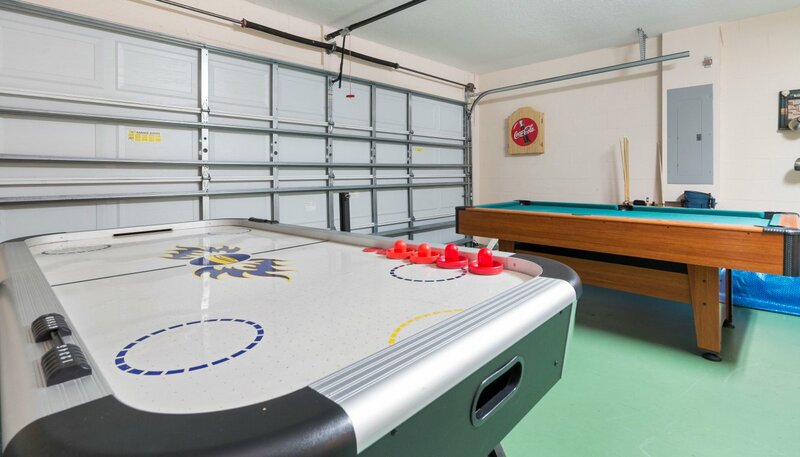 The home is fully air-conditioned and fully equipped for every possible need to make your vacation as enjoyable as possible. Our guests have been amazed how luxurious the home is and have said it is better than any 5 star hotel they have stayed in. 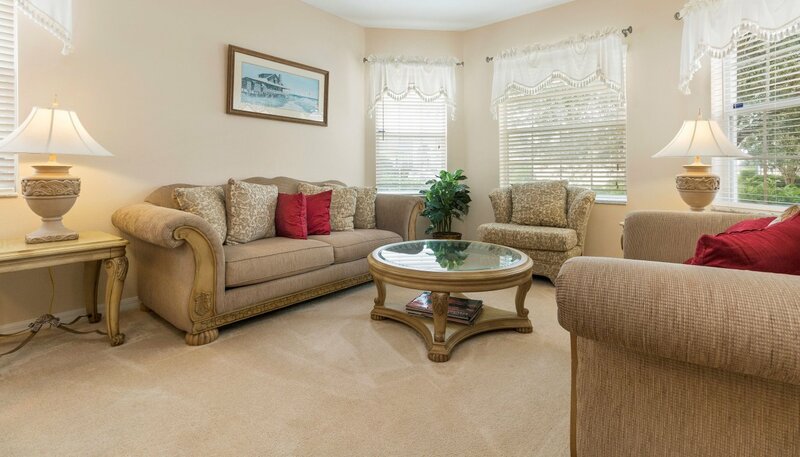 As you enter the villa you find the living room with 2 sofas with seating for up to 6. 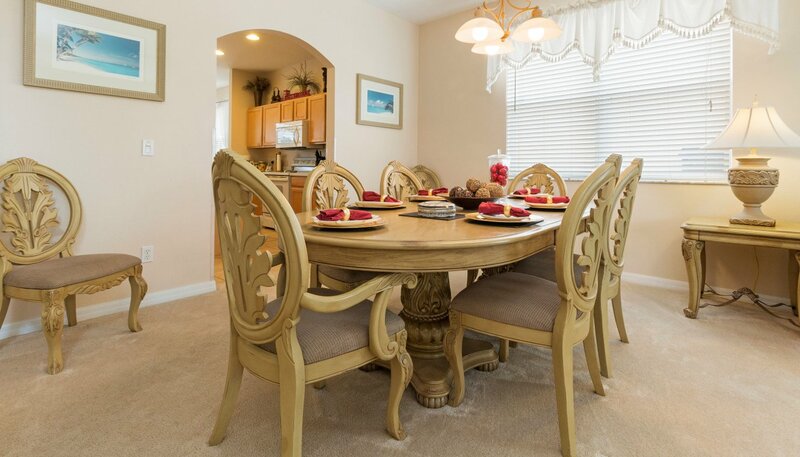 The formal dining area is located next to the living room and has a large table with 6 - 8 chairs beautifully set out for those special dining occasions. The comfortably furnished room with views onto the pool deck offers ample seating for you to relax and watch the large LCD cable TV with DVD player. To provide extra sleeping capacity, we have a quality sofa bed which enables 12 guests to stay in our villa. The large open plan kitchen comes complete with all mod cons to make your holiday as relaxing as possible. Amenities include full size cooker, waste disposal, fridge/freezer with icemaker, microwave, dishwasher, coffee maker, crockery & cutlery - all you need is the food and drink!! 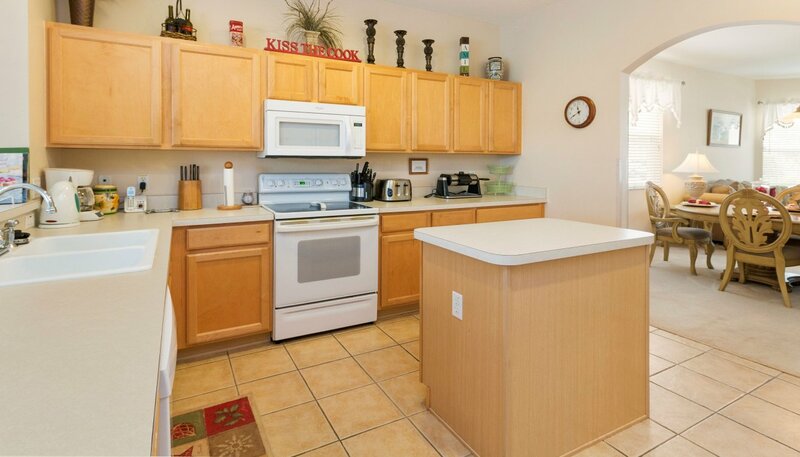 Previous guests have commented on how extremely well-equipped the kitchen is. 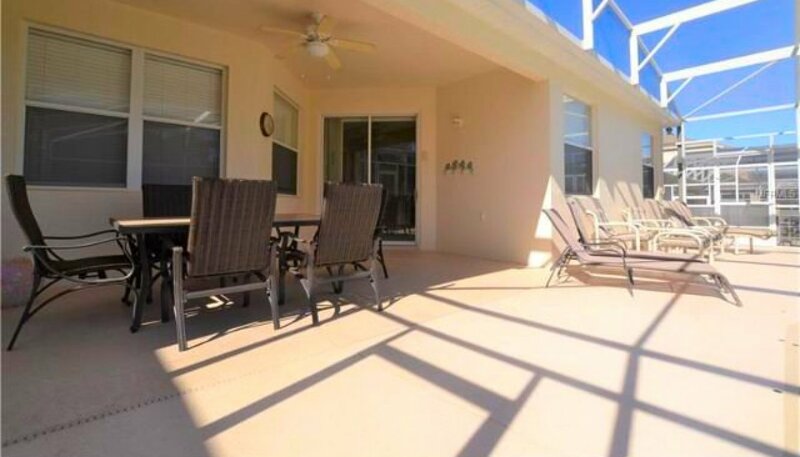 The breakfast nook looks out on to the lanai and pool area and has a table and 6 chairs plus and additional 2 bar stools at the breakfast bar. 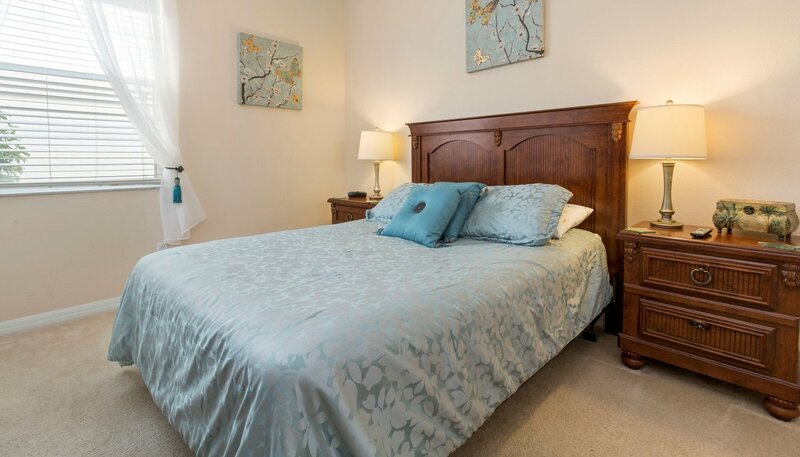 A delightful ground floor bedroom comes equipped with a queen sized bed with matching nightstands and chest of drawers with cable TV above. 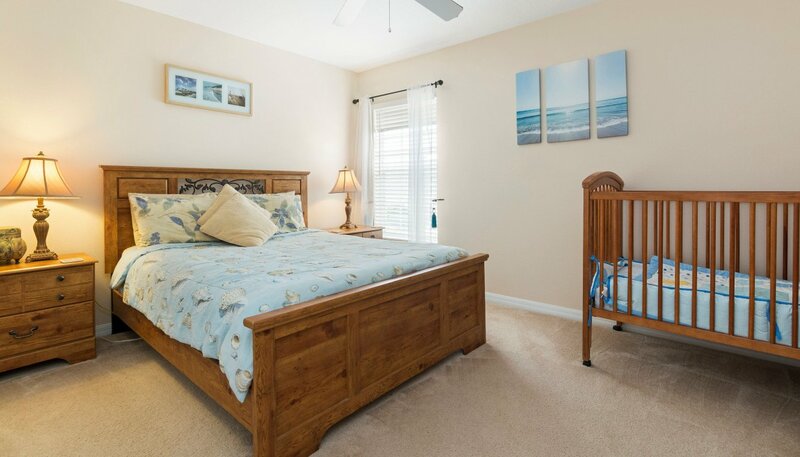 Within the room, we also have a ceiling fan and a large walk-in closet. 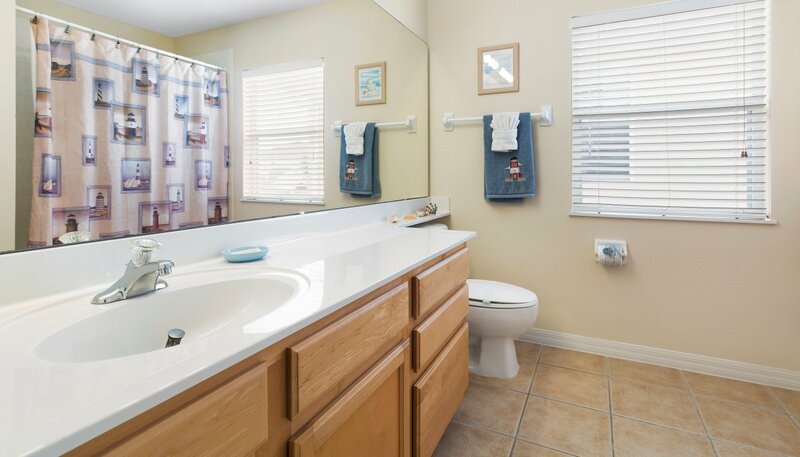 This shared family bathroom located next to bedroom 2 has a bath with shower over, WC and built-in sink unit. Should the kids have any excess energy after those days at the park, or on those days when the parents want to relax around the pool, we have provided something to keep them happy. 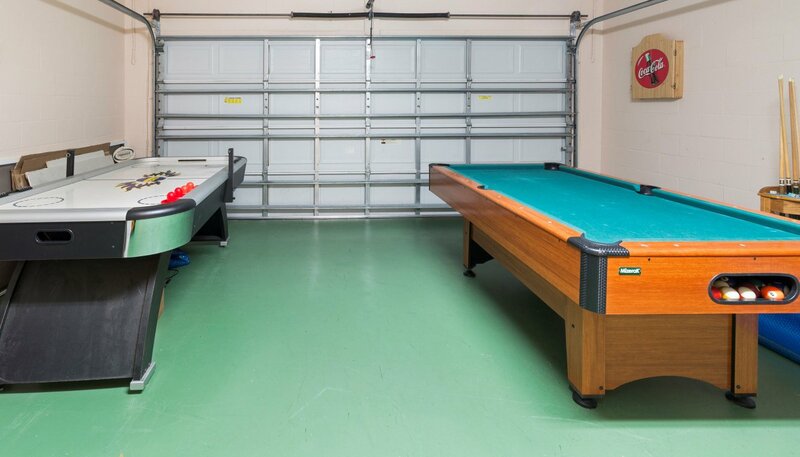 All of the garage has been converted to a games room with a full size 8' pool table, air-hockey table and a dartboard. 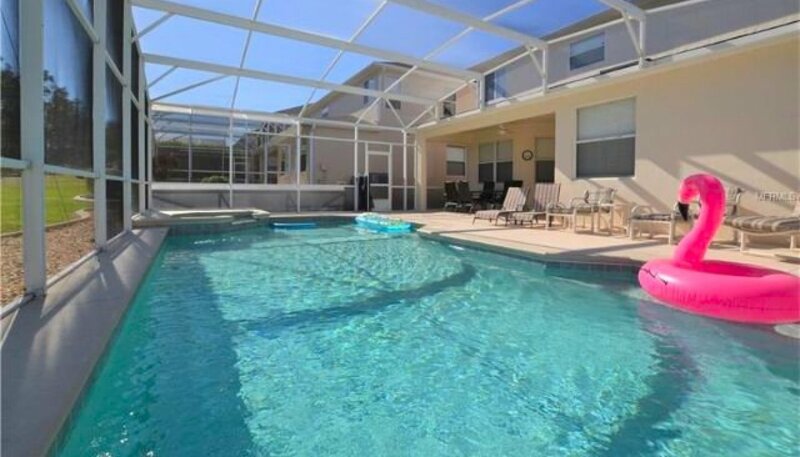 The luxurious private pool and spa offers wonderful views onto the 3rd fairway and provides an excellent location to sunbathe and to relax in the evening warmth in the Florida climate. 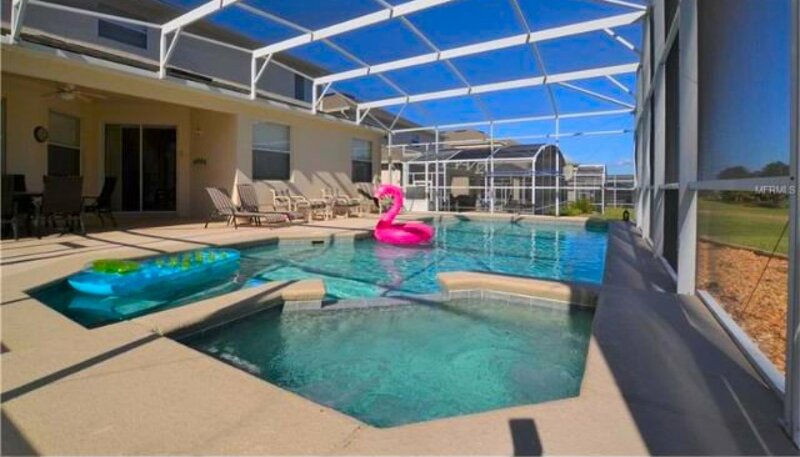 The pool can be heated for an additional daily charge (recommended for October to April stays) but for those really hot days of summer, the lanai is equipped with a ceiling fan to help keep you cool as you sip those iced drinks by the pool. 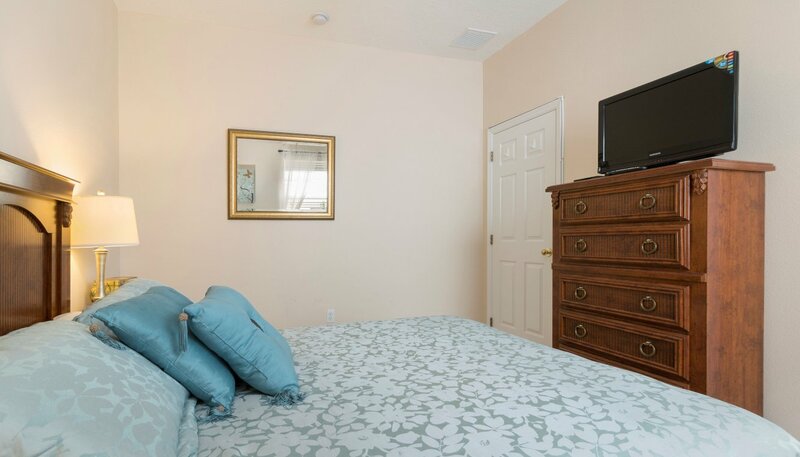 This magnificent room is furnished with a king sized bed with matching nightstands, chest of drawers with mirror above, cabinet enclosing an LCD cable TV and a large walk-in closet. The soft furnishings and decorations really make this room special and this room enjoys lovely views onto the golf course. There is also a safe provided for your convenience. The adjoining ensuite bathroom enjoys his and hers vanity units, large corner bath, separate walk-in shower unit and separate WC cubicle. 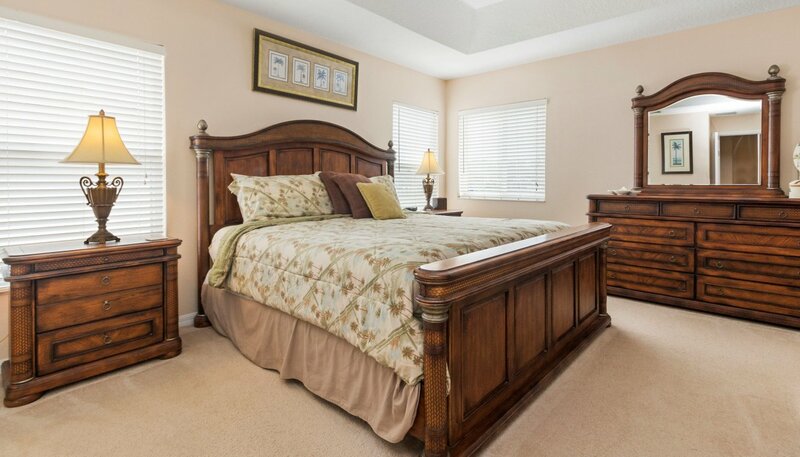 This bedroom comes equipped with a queen sized bed with matching nightstands and chest of drawers with mirror above. 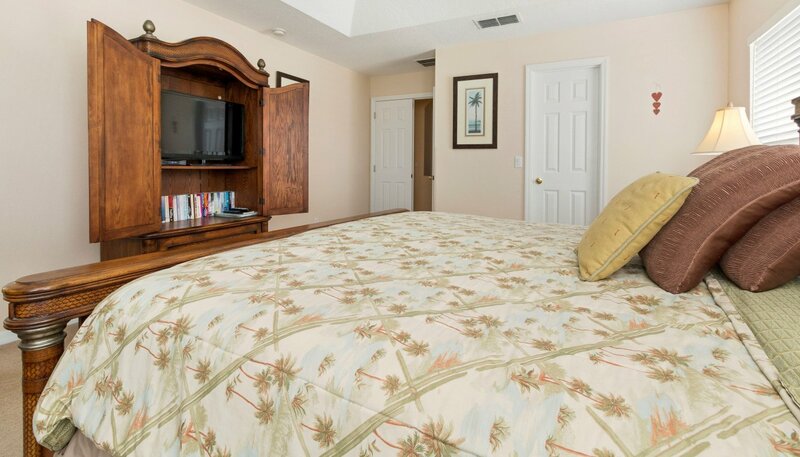 Within the room, we also have an LCD cable TV, ceiling fan and large built-in closet. 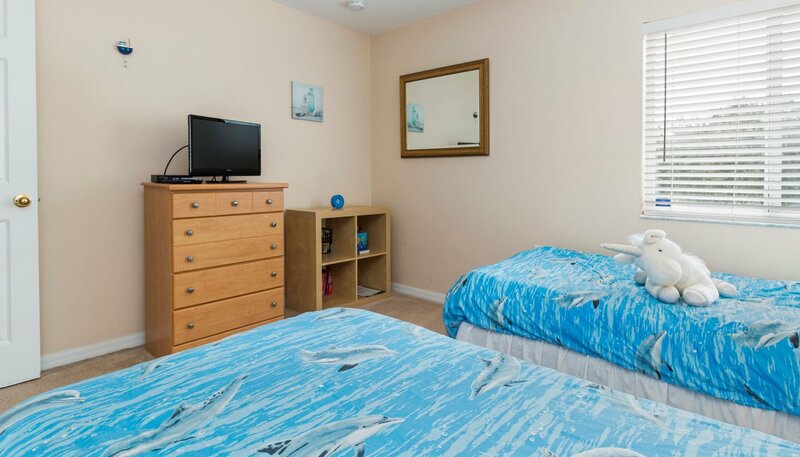 This Dolphin themed bedroom comes equipped with 2 x twin sized beds with a matching nightstand and chest of drawers with LCD cable TV above. 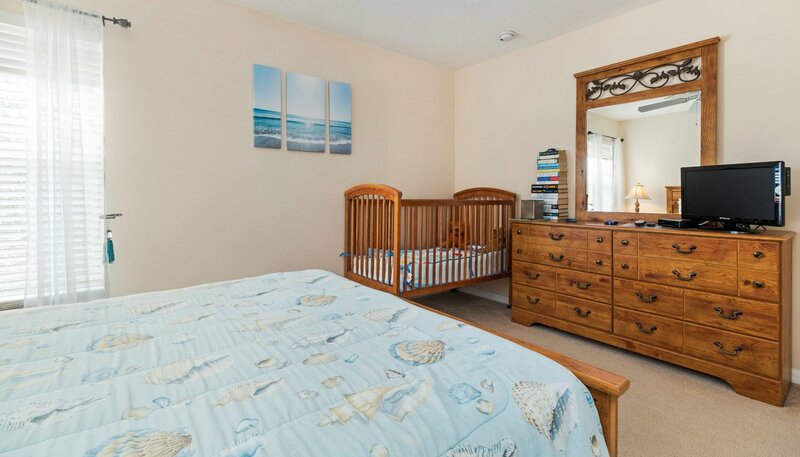 Within the room, we also have a ceiling fan and built-in wardrobe. 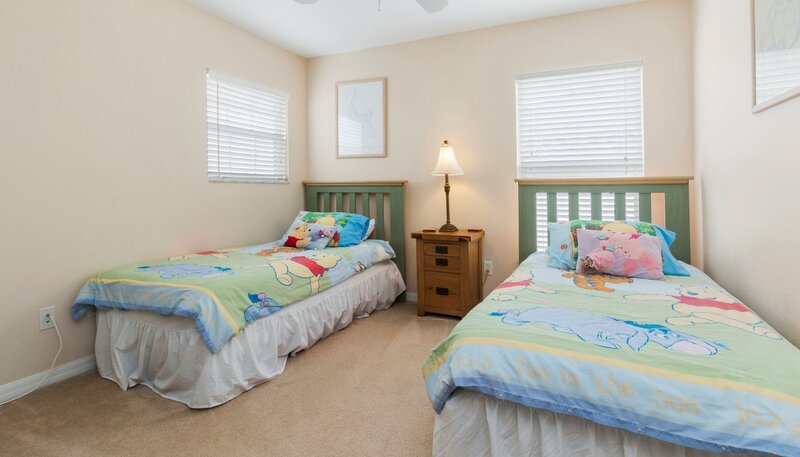 This room is situated next to the upstairs family bathroom. 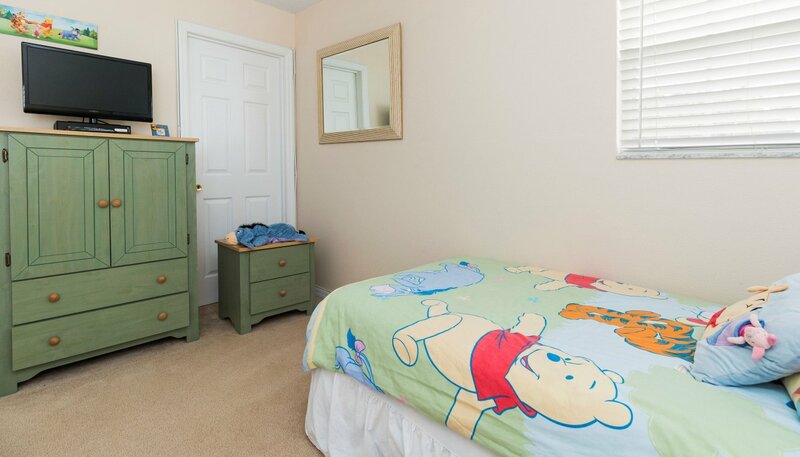 This Winnie-the-Pooh themed bedroom comes equipped with 2 x twin sized beds with a matching nightstand and chest of drawers with LCD cable TV above. 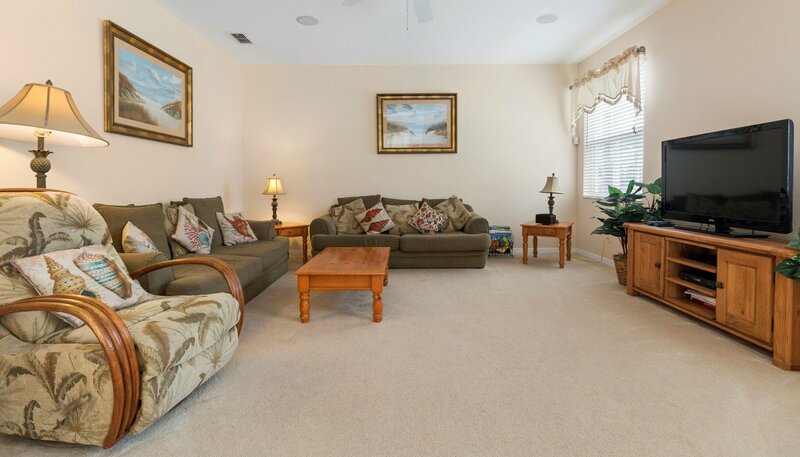 Within the room, we also a ceiling fan and large walk-in closet. 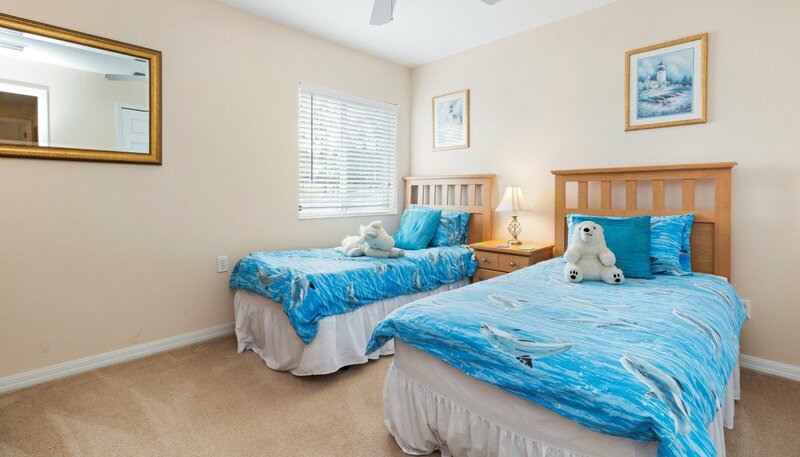 This room is also situated adjacent to the master suite. 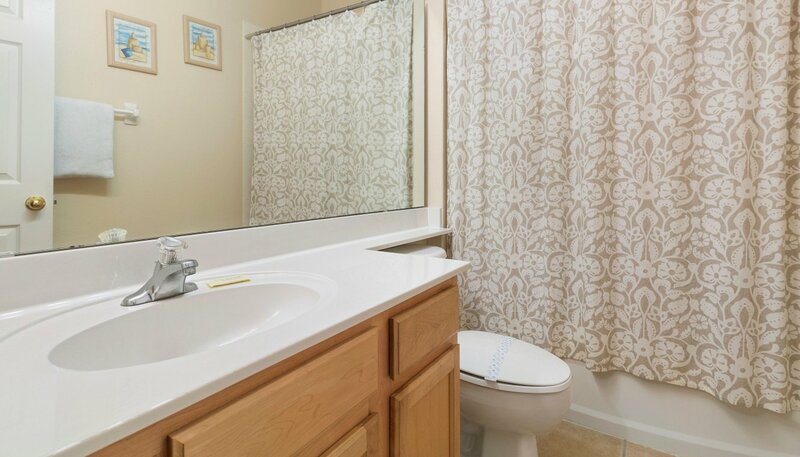 The remaining family bathroom has a bath with shower over, WC and built-in sink unit. 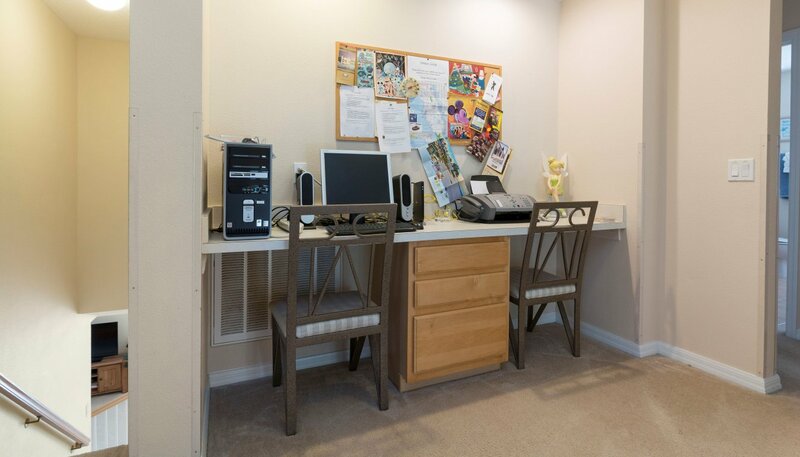 Spacious galleried landing with double desk area equipped with free WiFi. This place is an ideal place to set-up your laptop if you have one with you. We provide free high-speed WiFi internet access throughout the villa and pool deck. We have tried to include everything a young family could wish for in a holiday home such as a Cot (Crib), Travel Cot (Crib), Stairgate and High Chair on request. 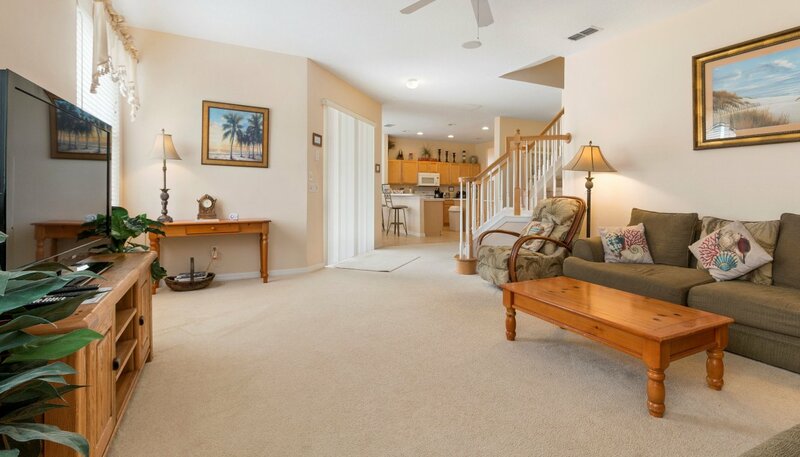 House was welcoming, exactly as described, well equipped and was a pleasure to come home to after a hard day at the parks. Would really recommend it. 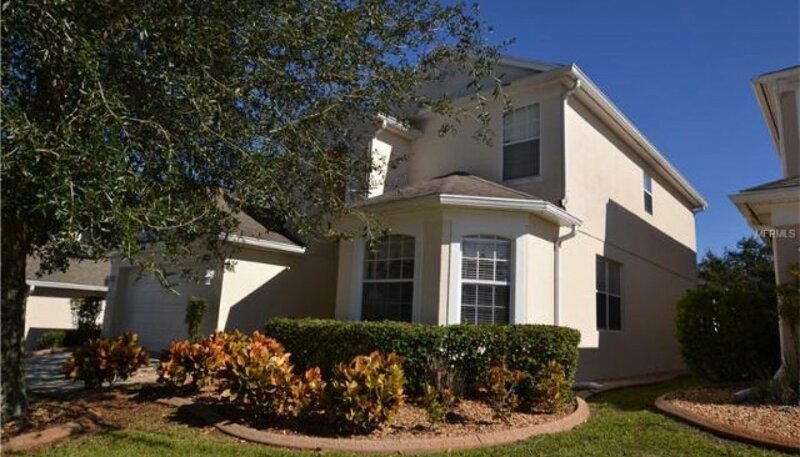 This villa is in an excellent location on Highlands Reserve. 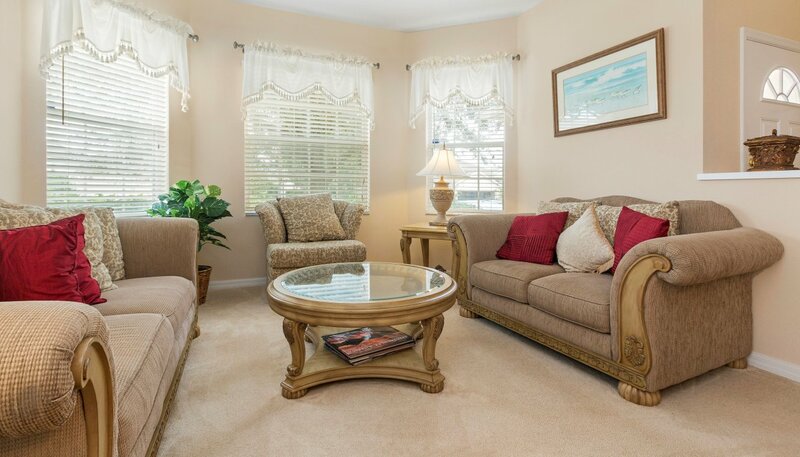 Berry town centre is just a 5 minute walk away. 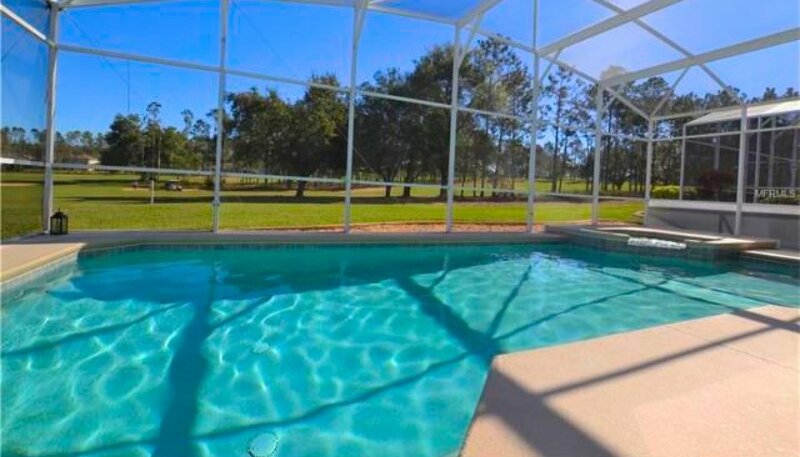 The view over the golf course is lovely which you can enjoy from the large pool or jacuzzi. 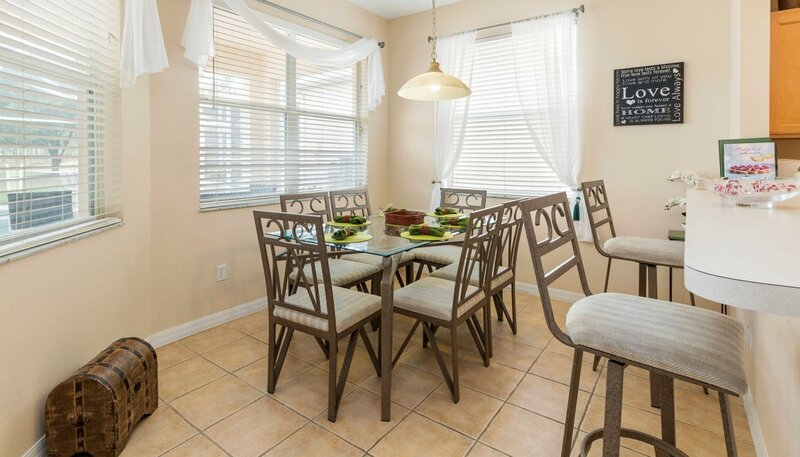 The villa itself is beautiful with plenty of board games, books etc to relax with after the parks or shopping or indeed Hurricane Irma which we had the horror of encountering. The management team were fantastic cleaning up our pool in the days that followed. We will definitely return.